The most popular and indigenous songs are Hoyrats. Hoyrats, longplay songs with nearly twenty different melodious voices forming rich literary texts are typical Turkmen musical works. 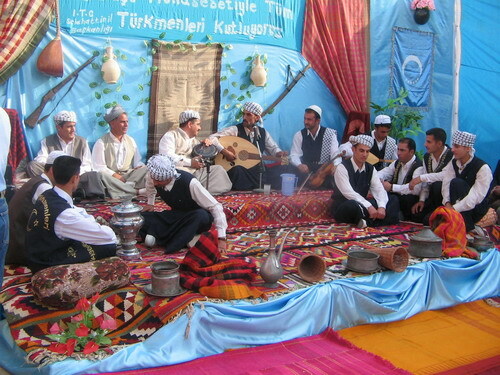 Hoyrats are classified according to tunes into Muhalif, Beshiri, Kesik, Yolcu, Ömergele, Muçyla, Yskenderi and Matari and regarded as typical Turkmen songs in Iraq and elsewhere. Hoyrats are a form of uzun hava built on quatrains which often contain allusions and plays on words. They are sung throughout Eastern Anatolia, Southeast Anatolia and Kerkük, which today lies within the borders of Iraq. Hoyrats are referred to by a variety of names, some of which include gelin (bride) hoyrati, nöbetçi (watchman) hoyrati, muhalif (contrary) hoyrati, kesik (cut) hoyrat and muçula hoyrati. Short plays/Kyrykhavas are locally called Beste. Beste is divided into groups based on the subject matters, such as love, homesickness and death; nature (pastoral), games, ceremonies etc. Songs depicting bravery and historical events are called Neshide or Sharky.